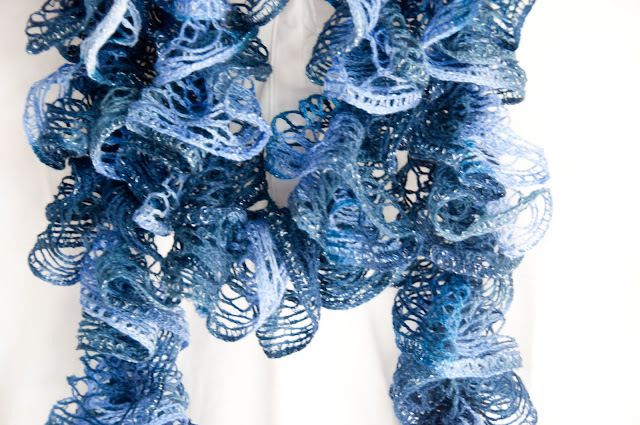 This is such a pretty lightweight scarf. I love all the ruffles. It’s the perfect accessory thrown over a t-shirt in warmer months or worn with a jacket when it’s cooler. It is really simple to make too! 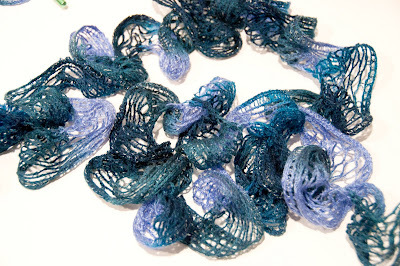 This specialty yarn creates ruffles with very little work. 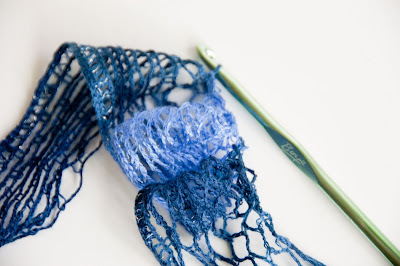 If you are comfortable making chain stitches and single crochet stitches you can use them to quickly create a scarf, just be aware that you’ll work with the yarn a bit differently. With a specialty yarn such as this your work is less about the look of the stitches—it is about using crochet to gather the yarn, forming ruffles, and securing them so they maintain their ruffled shape. You’ll notice that this unique yarn looks like ribbon on the skein but is actually constructed similar to webbing. 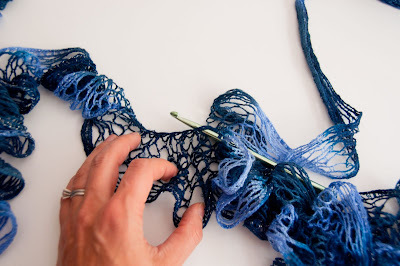 Before beginning take a good length of yarn off the skein and spread it out from the end about four inches. You’ll leave this “tail” for hand stitching down to your work later (a unique way of finishing rather than weaving in your ends). 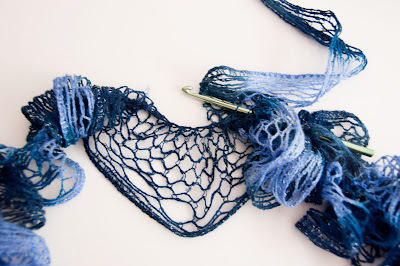 Place the part of the yarn with the metallic thread at the bottom and identify the first row of holes or loops across the top. This is where you’ll be working. Insert your hook in one of these holes about four inches from the end. This simple action takes the place of creating a slip knot. Now you’ll skip the next hole/loop and insert your hook in the hole after that. Pull this loop through the initial loop on your hook. 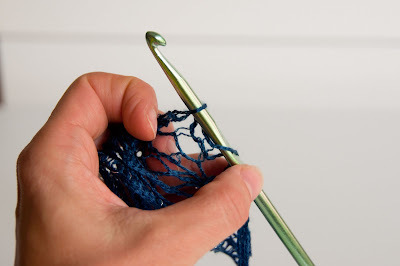 You have just completed one chain stitch. Repeat from * to ** until your work measures 80”. Turn. 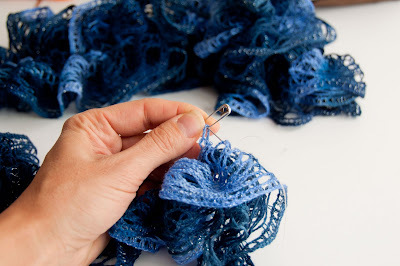 You are going to work in single crochet on the opposite side, creating another set of ruffles. Keep the ruffles hanging down out of the way of your work. 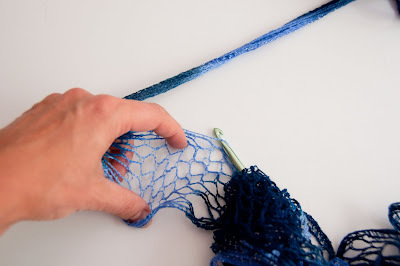 To work your first single crochet insert your hook back into the first “hole” at the top of your work. (It’s difficult to see these little holes. They are at the top and you can see that the threads are more twisted than the ones below. The important thing is to work consistently to create the ruffles and don’t worry too much about it as your actual stitches won’t be visible.). 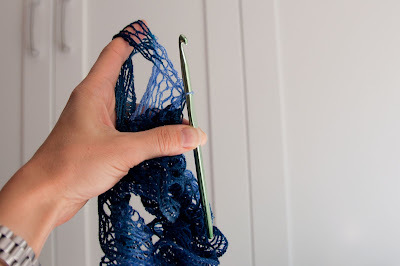 As you are hooking the working yarn continue skipping holes as you did with the beginning chain. 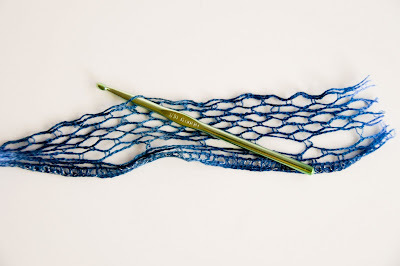 Repeat single crochet stitches until you reach the end of the chain and the beginning tail. Cut the yarn creating another 4” tail. 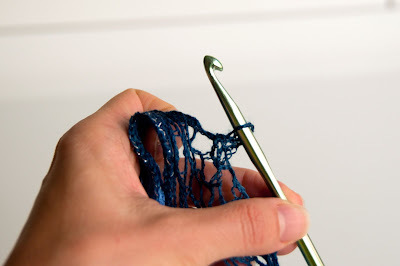 Place a stitch holder or safety pin in the loop left on your hook so it doesn’t slip off and begin to unravel. Lay the yarn ends on top of each other and knot them together with needle and thread in one of the holes close to the raw edge. Now weave the thread through holes along this raw edge and cinch the thread to gather a bit. 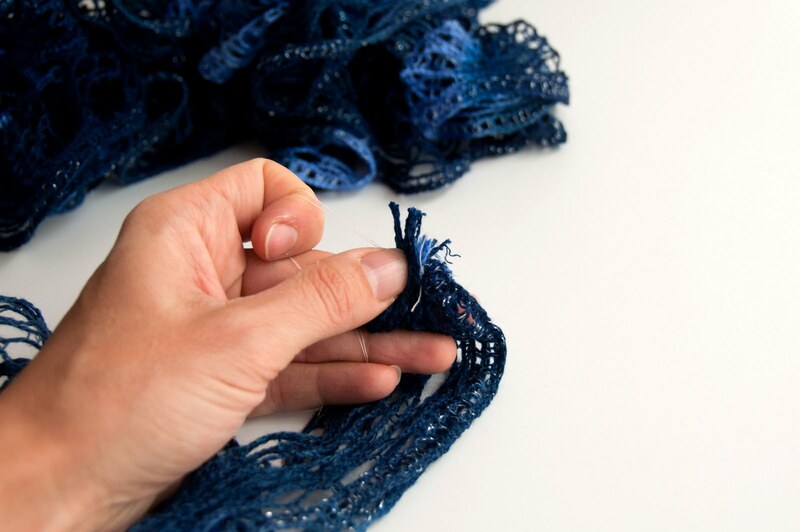 Take the thread and insert it through the last loop of your work, removing the safety pin/stitcholder. 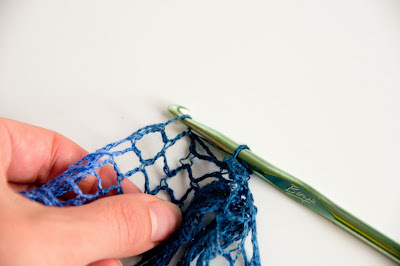 Make a few stitches securing the raw edges to the end of your work. Tie off off your thread and you are finished! 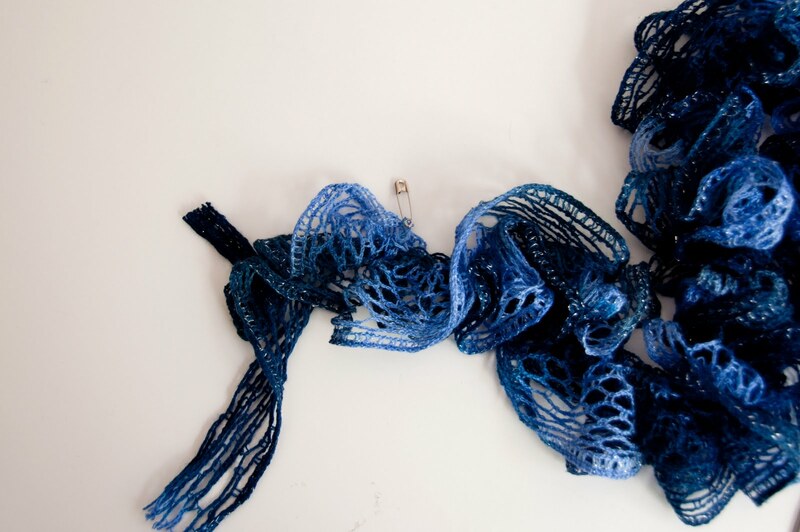 Throw it around your neck and enjoy the light weight ruffles!